Isha was up late, waiting for Rosh the next evening, despite his being late from work. She served him dinner and as he settled down to eat, asked him, "Tell me more about Geshe Ben's novel ways of taming the mind." Rosh understood. He smiled and spoke between mouthfuls of food, "One day Geshe Ben was expecting a visit from a large number of his sponsors." "Wanting to impress them, he fretted and fussed. He arranged and rearranged that day's offerings on his shrine in front of the image of Buddh." "Examining his handiwork when he was finally satisfied, he suddenly realized that his intentions were not pure. He had done what he had done today merely to try and impress his patrons." "Disgusted with himself, he picked up a handful of dirt and threw it over the offerings saying, "Monk, just stay where you are and don't put on airs!" "It is said that when Pha Dhampa Sangye or 'Father Dampa Sangye' heard this story, he said, "That handful of dirt that Ben Kungyal threw was the best offering in all Tibet!" “We have no control over what thoughts will arrive in our minds,” answered Rosh, “But if we can remain constantly vigilant, recognize the wrong immediately, confess it and try not to do it again, we do less and less wrong. Which also simply means that we will begin to do more and more right." "Have more food", Isha insisted when she saw that Rosh was almost done, eating as well as speaking. 'One way to this man's heart', she thought lovingly, 'is through his tummy'. And, it was beginning to show. "Tell me more", she asked once she had filled his plate with another generous helping of rice and curd. Rosh put his spoon aside, poured curd on his rice, and sprinkled some salt over it. He started eating again, creating little balls of curd-rice before popping them into his mouth with his fingers. "One day Geshe Ben was at a large gathering of geshes at Penyulgyal. 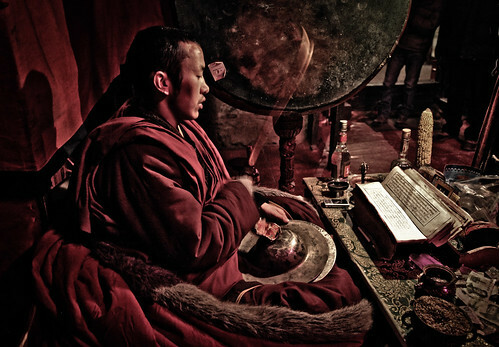 Geshe, as you probably already know, is a Tibetan Buddhist academic degree for monks and nuns. As part of the meal, some curd was offered to the guests." "Geshe Ben, it is said, was seated in one of the middle rows, and noticed that the monks in the first row were receiving large portions." "Suddenly realizing what he was thinking, he caught hold of himself: 'You curd-addict!' he thought, 'Here you go again'. "He immediately turned his bowl upside down. As it turned out, there was enough curd for everyone. When the man serving the curd came and asked him if he would like some, Geshe Ben refused." “This evil mind has already taken its share,” he said. "But there was nothing wrong in wanting to have a fair share?" Isha objected. “If the mind can always be examined like this and taught, adopting what is wholesome and rejecting what is harmful, it can become malleable and there can be hope that it can be tamed." "And have you tamed your mind yet, my husband?" Isha teased, clearing the dinner table. "Then make sure you do not fail me tonight! ", she commanded, a twinkle in her eye. His smile deepened as he responded, "I have never said, Do as I do. But do as I say, and there is hope - for you." She laughed throatily at his rejoinder, then retorted, "There is always hope, so long as there is love." "Come here", she flashed a mischievous grin, "Let me fill you with both." She touched him ever so lightly. Sensually. Music began in his mind. “Go Kamli”, he said, as he waited. Waited and watched. She moved slowly. Then her tempo accelerated, accelerating the beats in his temple. Taming of the beast had begun.